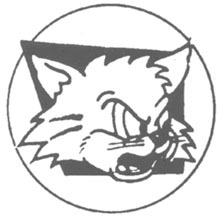 After a victory over Auburn in 1917, the Atlanta Constitution headlined the story “Wildcats Twist Tigers’ Tail.” and shortly after that the wildcat image made its first appearance in yearbook and then regularly on the pages of the student newspaper. Upon the death of this beloved mascot, Felix II’s skin was stuffed, mounted, and placed in the trophy room. That same year, two new wildcats appeared on campus. A yearling “Min” was purchased by the student body for $35. Captured when she was a kitten, Min was fairly tame and could be led about. “Tom” was donated by Mr. Hansell Watt, of Thomasville, Ga., who captured him in Monticello, Fl. Tom was noted for his ferocity and “fighting spirit.” Tom and Min produced two little wild-kittens. At an unknown date, Felix III, a “pampered and petted mascot” with a “ferocious appearance” arrived on campus. In his early days he was the glory of the campus and the teams, but as he aged his popularity fell. 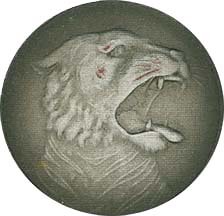 “Maybe Davidson man became too sophisticated to put their faith in such a mascot as Felix, but more probably they just tired of the snarling little cat.” Felix was cared for by Doc White until Felix’s death of old age in 1941, shortly after the end of the school year. For almost a decade, the college held a record. On September 28, 2001, what was then the world’s largest Wildcat arrived on campus. “Weighing 1,500 pounds and measuring eleven feet from outstretched paw to tail,” the bronze statue was a gift from Irwin Belk ’45. It was sculpted by Jodi Hollhagel and Hanna Jubran. The statue was placed between Richardson Stadium and Baker Sports Complex. “College Snares Live Cat: From Pet Shop To Swamp.” Davidsonian. 6 October 1961. Wildcat Mascot Davidsoniana file. Davidson College Archives, Davidson, NC. Fairly, John. “Death Claims Local Mascot.” Davidsonian. 30 October 1941. Wildcat Mascot Davidsoniana file. Davidson College Archives, Davidson, NC. Giduz, Bill. 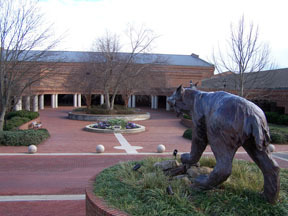 “The ‘Big Wildcat’ Arrives on Campus.” Davidson News and Events Website. 8 October 2001. Wildcat Mascot Davidsoniana file. Davidson College Archives, Davidson, NC. “Growl of Mascot Silenced by Death.” Davidsonian. 22 September 1927. Wildcat Mascot Davidsoniana file. Davidson College Archives, Davidson, NC. Lily, Henry T. Letter. Wildcat Mascot Davidsoniana file. Davidson College Archives, Davidson, NC. Loflin, Tom. “Capricious ‘Cat Report: Ney Not Underachieving.” Davidsonian. 5 October 1962. Wildcat Mascot Davidsoniana file. Davidson College Archives, Davidson, NC. Loflin, Tom. “Mascot Gets Name… Peter Stuart Ney Lives On!” Davidsonian. 20 October 1961. Wildcat Mascot Davidsoniana file. Davidson College Archives, Davidson, NC. 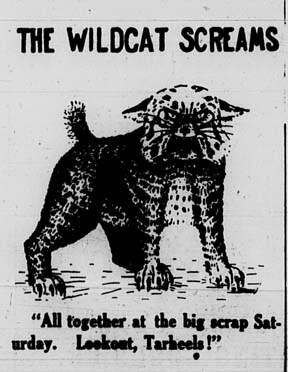 “Oldtimer Recalls Wildcat’s Origin.” Davidsonian. 8 February 1952. Wildcat Mascot Davidsoniana file. Davidson College Archives, Davidson, NC. “The Original Wildcats Return to Campus for Big Reunion.” Davidsonian. 16 October 1953. Wildcat Mascot Davidsoniana file. Davidson College Archives, Davidson, NC. Tarr, Brian. “Wildcat Lore.” Davidson Journal. Summer 1992. Wildcat Mascot Davidsoniana file. Davidson College Archives, Davidson, NC. “Two New Wildcats Take Place of Former Mascot.” Davidsonian. 3 November 1927: 1. Wildcat Mascot Davidsoniana file. Davidson College Archives, Davidson, NC. “Why They’re Wildcats.” Alumni Journal. December 1955. Wildcat Mascot Davidsoniana file. Davidson College Archives, Davidson, NC. “Worthy Successor to Faithful ‘Felix’ Wildcat Mascot, Found in Murphy, N.C.” Davidsonian. 29 September 1927: 1. Wildcat Mascot Davidsoniana file. Davidson College Archives, Davidson, NC.